Located in central Vietnam, Da Nang is a coastal city, known as one of the most beautiful city in Vietnam with sandy beaches and many attractive destinies for tourists. 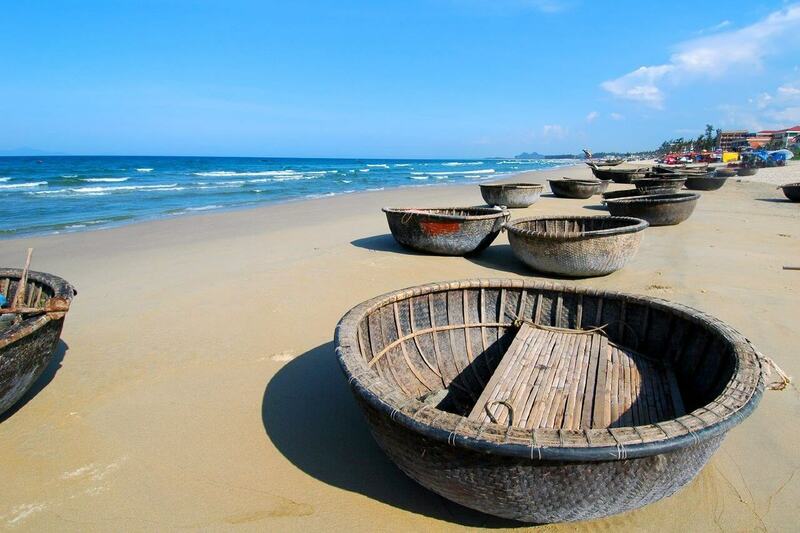 The name “Da Nang” has origin from Chams “Daknan”, means the vast waters. 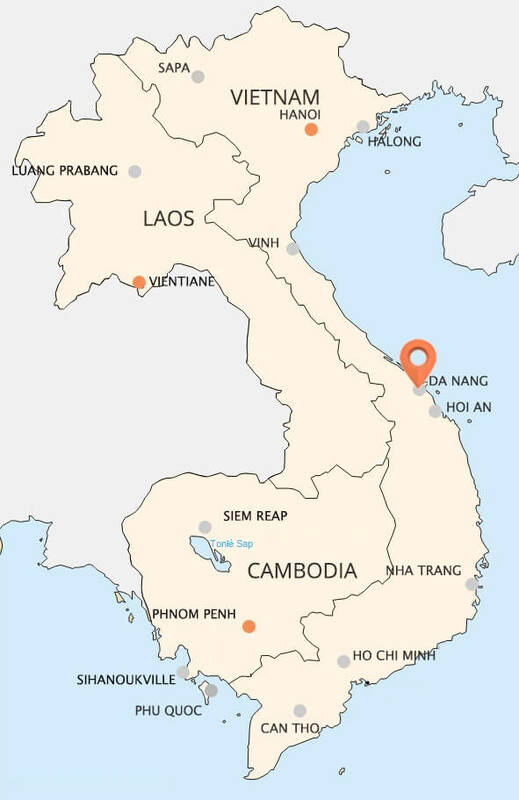 In 1835, following King Minh Mang’s edict, Da Nang became the biggest trading port in the central. After the completion of invasing Vietnam, 1898, the French separated Da Nang from Quang Nam and renamed to Tourane, marked the birth of th city. From the idea that Da Nang is an ancient seaport, standing adjacent to mountains, rivers, fields, in a amazing, harmonious natural landscape, situated in the middle of the country, Da Nang’s symbol was designed with the theme "Green mountain, green river, green sea. White wind, white sky, white sand." with the imagery describing Marble Mountains, especially legends about God Turtle’s Egg, reflecting the river, fields of Hoa Vang, undulating ripples reminiscent of the blue beach, sparkling sands of Thanh Khe, Lien Chieu, and bridges linking Hai Chau, Son Tra in a diverse and united city. Simple symbol, harmonious combination between nature and man, tradition and modern, but prominent, easily identifiable Da Nang, easily expressed on many materials. Marble or Non Nuoc Mountain is a famous destination. In the memories of many people, it is also the "local spirit" of this ancient land. Marble Moutain is a tourist destination was a lot of visitors in the country and internationally known. Located about 8 km to the southeast from Danang, Marble owns the converging of vast sea and sky with the historic, cultural and deeply spiritual values. 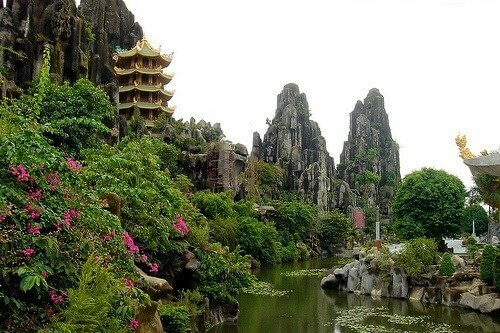 According coastal path stretching towards Hoi An, it opens up for tourists as giant "Penjing" named Marble. With the name placed following the Five Elements theory includes Kim Son, Moc Son, Thuy Son, Hoa Son and Tho Son, each mountain has their own legendary stories of different mystic beauties. If you are adventurous, visiting cave liberal and unique system in Marble Mountain is an exciting experience. Although they are not massive, monumental but they brings many different sacred, magical beauties to the tourists. 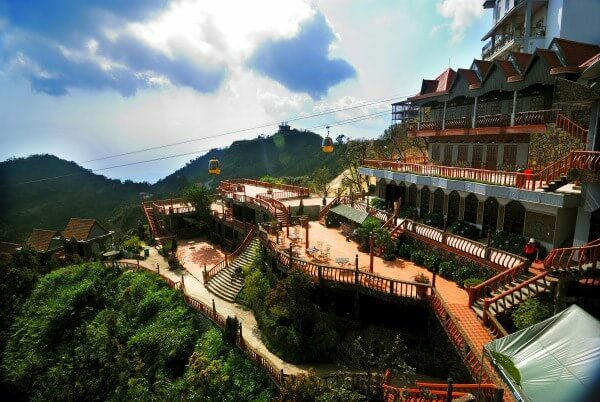 The most interesting thing here that other tourist attractions are difficult to obtain after hours of climbing up and down hundreds of steps to visiting caves and temples, visitors just need to come out a few hundred meters to contemplate Non Nuoc beach. White sand, blue water, soft waves are welcome visitors to the salty waters, mountain views and immense sea. Marble is not only a cultural symbol in the mind of every Da Nang’s person but also the destination of Central tourism - heritage route. 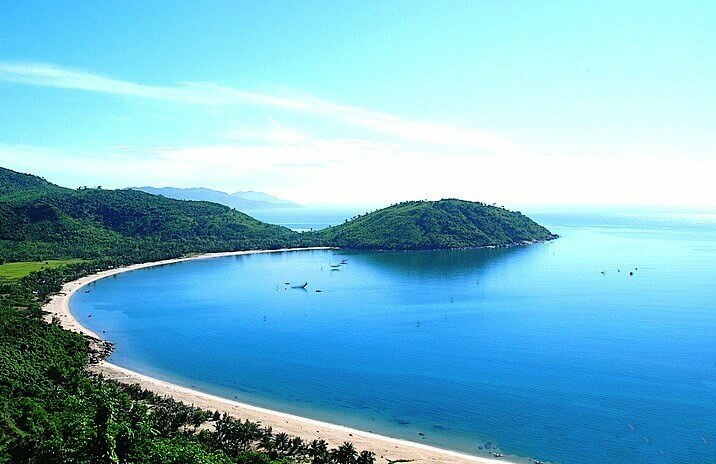 Son Tra Peninsula is located in Tho Quang ward, Son Tra District, Da Nang city, with an area of 60 square kilometers, about 10 km from center of the city. With Hai Van Pass, Son Tra Peninsula is the cover of Da Nang city. Visitors will certainly be surprised by primary forests which contain typical values of biodiversity and cultural history. Son Tra Peninsula is situated in the fresh cool climate, with its beautiful natural landscape of abundance flora and fauna. It converges all the elements for visitors to come to relax, organize recreational activities, go camping, go picnic or discover the fascinating adventure tinged with wild jungle. The journey to discover Son Tra will take visitors conquer heights of 500m. Taking a breath at Vong Canh Hill, you will be immersed youself in the fairy space with slowly floating white clouds, white sand and blue sea at Pearl Island and faraway Hai Van Pass. Symphony of sun and wind will carry you to Ban Co top, make you feel that you are travelling the heaven in mysterious mist. Along the ridge to the southeastern of Son Tra, you will contemplate the great banyan tree with 9 sub roots rammed deep into the ground, listening to the birds singing, and if you're lucky you could watch the endangered animals: the brown leg Langur dancing on the tree branch. All is so primitive and wild. 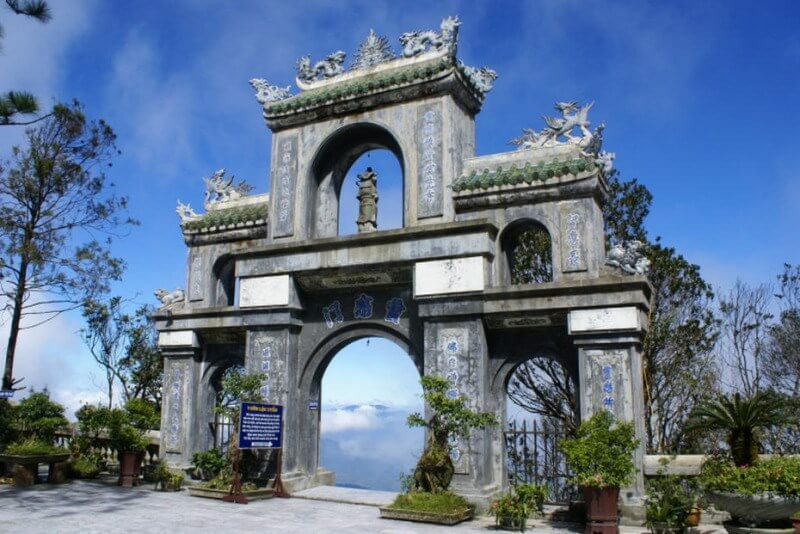 Linh Ung Pagoda which is located in on the summit of Bai But, Son Tra Peninsula, Da Nang is considered Buddhist realms on the ground. Situated on a hill, with the shape like a sea turtle swimming to the ocean, its back against the vast primary forest with various kinds of bird, Linh Ung Pagoda is not only an important imprint of development of Buddha in Vietnam in 21th century but also the convergence of quintessense. It imposingly stands on an area of 20 hectares of Son Tra mountain with items: main hall, ancestral house, auditorium, library, canteen, toilets, gardens, statues of Arhat and many items are still unfinished construction. Pagodas brings a contemporary style combined with traditional temples of Vietnam. Important highlights of the Linh Ung Pagoda is Guanyin Buddha which is considered the highest in Vietnam with the height of 68 meters. The statue stood leaning against the mountain, overlooking the sea, a hand caught eighty publications, the other one holding nectar bottle as sprinkling peace to the far offshore fishermans, carrying many prayers about peace and fortunate. The birth of the Linh Ung Pagoda reaffirms of the policy respecting religious freedom of Vietnam. My Khe Beach is located in Phuoc My Ward, Son Tra district, about 2 km from the center of the city. Da Nang gathers a lot of beautiful and famous beaches such as Nam O beach, My Khe Beach, Tien Sa Beach, Non Nuoc Beach... In particular, My Khe Beach, which has a length of 900m, are the busiest sea and very familiar to the people of the city as well as international visitors. My Khe Beach is famous for its white sand, peaceful waves, warm water throughout the year and dreamy beautiful surrounding coconut trees. My Khe Beach are free opening to all visitors, with long flat sandy beach; sunshine and the waves are suited to play the sports, able to ensure the safety of travelers alongside luxury resorts, international standards villas. Like other beaches of Danang, My Khe is developing strongly many types of services for visitors such as fishing, windsurfing, diving, yacht. This beach also has rescue systems, including watch towers, life buoys, signaling flags swirling waters and rescuers on duty day and night, ready to rescue promptly as victims. My Khe Beach is home to many kinds of precious algae as gold seaweed, propellers seaweed with high export value. Environmental tourism in the region is relatively good. Da Nang city government completed construction of the Han River bridge linking the East and West regionsand it is now very convenient for travel.